Myrtle Scholl, 98, formerly of DeKalb, died on January 18, 2018, at Adirondack Tri County NRC. Burial will at Brant Lake Cemetery, at the convenience of her family. She is survived by her son David and his wife Nadine Todriff of Bolton Landing, he daughter, Cathy and her husband Grant Hayes of DeKalb Junction, 10 great grandchildren, 4 step grandchildren, many great grandchildren, 3 great great grandchildren, several nieces and nephews. She was predeceased, by siblings, Stanley Randlett, Laurence Randlett, Leon Randlett, Herbert Randlett, Ruby Payne, and Esther LaPier. Myrtle was born on March 3, 1919, in Chazy, New York, the daughter of the James and Flora Stiles Randlett. She married Orville Todriff on May 4, 1947 in West Plattsburgh, New York, he predeceased her on December 29, 1964, she then married Adolph Scholl on November 23, 1974 in Brant Lake, New York, and he predeceased her on June, 1993. 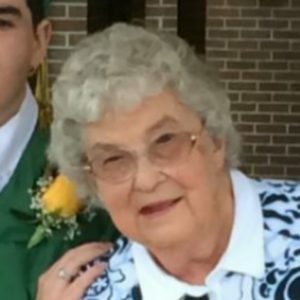 She was a homemaker, a clerk at SS Kregess in Plattsburgh and also a librarian in West Chazy. 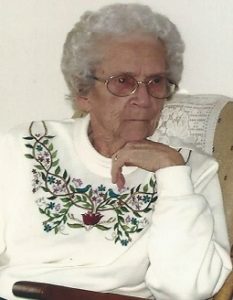 Myrtle was the oldest member of the Wesleyan Methodist Church in Brant Lake, she was also a member of the DeKalb Hermon Senior Citizen Club. She loved knitting, reading, and traveling. In lieu of flowers contributions can be made to the American Cancer Society. 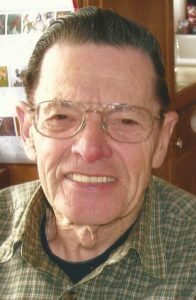 Kenneth P. Alguire, 85, of DeKalb, died on January 7, 2018, at his home. Calling hours will be, Thursday, January 11, 2018, 2- 4 and 6-8 PM, a funeral mass will be Friday, January 12th, 10 am at St. Raphael’s Church, Heuvelton, Father Kevin O’Brien officiating, burial will be May 4, 2018, 10 am at St. Henry’s Cemetery. He is survived by his daughters, Ann and her husband Brian White of Russell, Lorie and her husband David Gladle of Edwards, 6 grandchildren, Patrick Morrill, Amanda Oemcke, Leah White Megan McIntosh, April Gladle, Nicholas Gladle, 4 great grandchildren, Miles Morrill, Madison House, Tyler House and Lakeland Oemcke, several nieces and nephews. He was predeceased, by his daughter, Kathryn Hamilton, siblings, Harold Alguire, Maurice Alguire, Donald Alguire, Lyle Alguire, Clarence Alguire, MaryLou Alguire, Hazel Larue, Joyce Weaver, Helen Conger, and a great grandson Linden McIntosh V. Ken was born on December 14, 1932 the son of the late Harry and Anna Belle Thompson, Alguire. Kenneth married Lois J. Parish on December 15, 1956 at St. Henry’s Church, with Monsignor Thomas Robillard officiating, Lois died on May 11, 2014. He was a cheese cutter at McAdam Cheese until he retired in 1995. He was a parishioner of St. Raphael’s Church and enjoyed bowling, painting houses and mowing his lawn. In lieu of flowers contributions can be made to Hospice and Palliative Care of St. Lawrence Valley. Nelson Perrault, 60, formerly of, DeKalb, died on December 29, 2017, at Standifer Place, Chattanooga, Tennessee. Calling hours will be, Friday, January 5, 2018 , 4 – 7 PM, the funeral service will be 11:00 am, Saturday, January 6th at the funeral home, Lay Minister Frank Carter officiating, burial will follow in Pine Hill Cemetery, Eel Weir. He is survived Darlene Webb, his partner of 32 years, brothers, Gary Perrault of Indiana, William Perrault of Rochester, Stanley Perrault of California, a sister in law, Elaine Perrault of Tennessee, a sister Renee Chase of Maryland, several nieces and nephews. 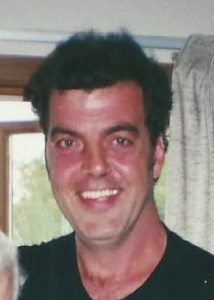 He was predeceased, by a brother Bruce Perrault. Nelson was born on February 22, 1957 in Ogdensburg, the son of the late Clarence and Edna Hughes Perrault. He was a maintenance worker and janitor at La Quinta in Tennessee. He loved his nieces and nephews and enjoyed watching television. In lieu of flowers contributions can be made to American Cancer Society or Alzheimer’s Association.